During a long hike in the Easter break we came across a number of styles that were very difficult for Guinness to climb or jump over, due to uneven ground on the other side or the height and design of the style. Some of them Guinness jumped but I was flinching as he almost landed awkwardly on the other side and a number of times I had to man-handle him over the styles. Not easy when he doesn’t particularly like being picked up! I therefore decided a harness with a handle would be much more practical, plus safer, and so started the endless google searching and review reading (of which I found very little). After a day I found the best, and only, harness suited for the job. The Ruffwear Webmaster! Originally designed for search-and-rescue dogs, “the Web Master lets you assist your dog up and down in a variety of situations”…”Ergonomic cut allows for a full range of motion, while still providing security that even the best “Houdini dog” can’t escape”. 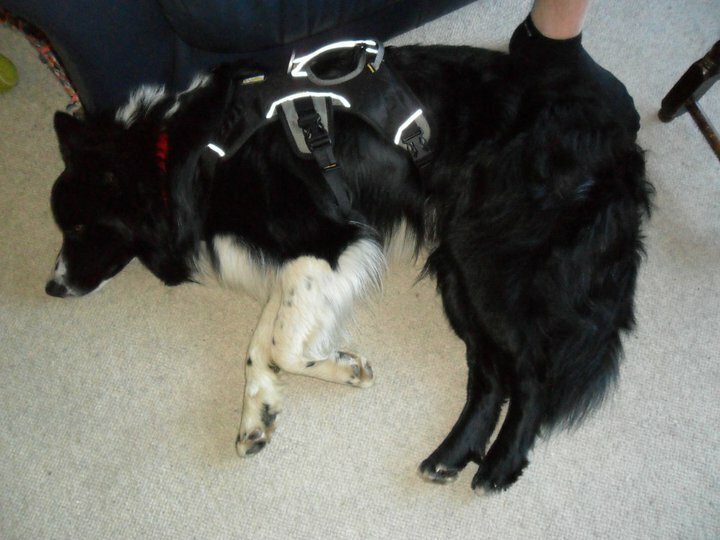 A number of sites describe the harness as great for “assisting your dog up and down stairs and around the house”! 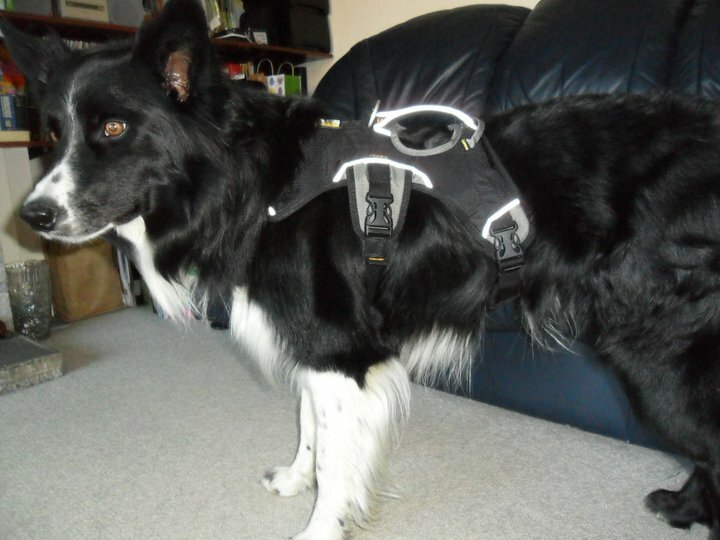 This really amused me as to find this harness I had searched for “active dog harness”. However it is true! 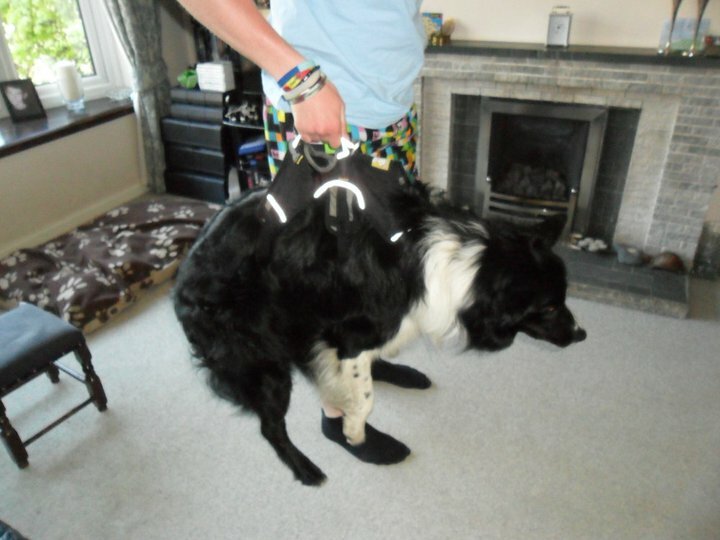 This harness is used equally for active outdoor dogs as it is used for older dogs that are unsteady of their feet. So I purchased my harness from Muddy Paws, whose service was excellent I must say. I bought a size Small for my Border Collie after measuring his girth as described on the websites and purchased the black version. So, what’s it like?! The harness fits like a standard harness, head in, right leg in, strap under armpit and click. Done. However there is then an strapped that comes under the dogs belly, towards the bottom of their rib cage that clips in. This allows the harness to be balanced and therefore the handle is exactly over a dogs balance point, which is towards the middle of their back. I was worried about this belly strap at first as I wasn’t sure how close it would sit to my dogs.. ahem.. manhood parts. However it sits snuggly a little in front without touching or getting in the way, and when he pee’s the strap is not sprayed at all. Therefore staying pee free. Perfect! The area on top of the harness is solid, with a hole where the handle is to allow accessibility to the handle. There are reflective strips across the handle and over the sections where the straps clip into place on each side of the harness. People have said these are not reflective enough, however I think they’re much brighter than expected and quite adequate to the job. The harness is made of a strong, outdoor material and a number of people have said their dog has rubbed against rock and branches without rips or snags. Guinness is great at squeezing through holes and hasn’t damaged his at all so they’re very scratch proof. Also the harness is quite water-resistant and after being out in the rain for a while, we walked 5 minutes home in the sunshine and the harness was bone dry by the time we reached home. The only parts that do take a long time to dry are the padded straps. The harness is quite bulky to feel at first, however once its on your dog and adjusted it fits really nice and the top part does bend to curve around your dogs back. Once its been worn in it adjusts a little to your dogs fit and therefore becomes aligned with their movement. The straps also tuck into the padded section and have elasticated bands, sort of like belt loops, which are perfect for keeping overhanging straps in place. For instance if the harness is required to be fully tightened there wouldn’t be excess straps flapping everywhere. Once I’d put it on Guinness he seemed to have no problems moving or running and behaved completely normally. At first time he did turn round and bite at one of the straps once or twice but then ignored it. While walking he occasionally uses his back leg to scratch at the belly strap, making me wonder if it rubs him, but I always check him over during and after wear and these’s nothing wrong. So I think this is due to him still getting used to the feel of the belly strap. I have often left the harness on Guinness all day and he has happily lied down and “flopped” on his side and slept so it is clearly perfectly comfortable. When I first lifted Guinness he struggled a little then held limp. With treats given during and after lifting and the added command of “lift” he’s quickly got used to the feel of it, although he makes a little grunt noise sometimes. I haven’t lifted him over anything yet simple because I haven’t had the chance, however with regular wear and training I can now lift him to chest height with comfort for Guinness and myself. How heavy is your dog? I find it takes a fair bit of effort to lift my 20kg, 3 stone dog with one arm, but its not difficult, plus its easy to place a second hand either on the handle or at the back of the harness. However I do wonder if you have a great big GSD if you’ll be able to use the full advantage of the lifting harness. But the handle is still good for assisting dogs up steep slopes or difficult terrain as I’ve also done with Guinness during our use of the harness so far. A key design of the harness I love in the chest padding. There is a triangle pad that sits on the dogs chest, instead of just bare straps as on other harnesses, which means that when they pull or are being lifted there is nothing digging into their chest. The two straps are also very padded where they sit on the dogs ribs and belly, but not padded all the way round leaving room for adjustment. These make it comfy for the dog to be lifted and the straps do not rub. Bottom line is, the harness is well designed for its use and the sizes for my dog is a perfect fit. The metal clip for attaching your lead to is great and very strong so there’s no way your dog will break free. The harness is tough, stylish and in my opinion does its designed job perfectly. Before you buy: If you are considering getting a rucksack for your dog it would be worth looking at the Ruffwear Palisades Pack which used the Web Master as a frame with detachable packs. Therefore the dog is still wearing the Web Master, however it is a Web Master with added clips attached for the rucksack sections, and you are paying double the price for two items. You Cannot buy the Web Master alone with these clips, nor the rucksack section alone. 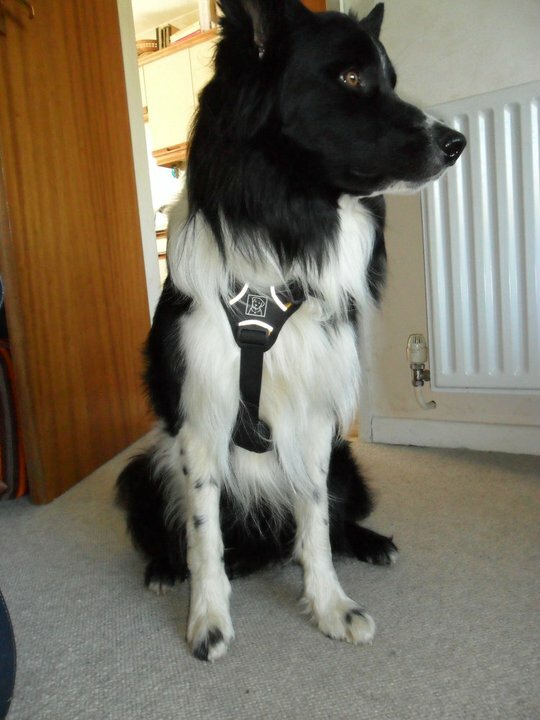 Loved your review of the Ruffwear harness. I have one question though, would you say that it lives up to the claim of “providing security that even the best “Houdini dog” can’t escape”? You don’t mention if Guinness (great name!) is a Houdini dog or not, but our Collie, Maisie, is a professional escape artist! I’ve read other reviews of the harness and I am impressed, it’s just a lot of money for something that might not work. However, if it does work, I’d happily pay twice that! Our other one, Mollie (who is Maisie’s cousin) is only 5 months old but my crystal ball says she’s going to have the same, erm, abilities! So if it does work, I’d get one for her when she’s bigger too.